Morgan belongs to the species Orcinus orca, also known as ‘orca’ or ‘killer whale’ (and many other names, depending on the language you are using). Regardless of the name used, all Orcinus orca are protected under the Convention on International Trade in Endangered Species of Wild Fauna and Flora (CITES, pronounced ‘sighteeze’). As such, a permit must be acquired to ‘take’ (which includes rescues), keep, or transport any orca. The Dolfinarium Harderwijk, in the Netherlands, had a permit to ‘take’ dolphins and was given permission to ‘take’ Morgan but this was under the caveat that her capture was for ‘rescue, rehabilitation and release‘. It is vital to remember that Morgan was NEVER stranded (this myth continues to be perpetuated by the likes of the companies who profit off her, such as SeaWorld Entertainment, Inc., and their fans who have never looked into the facts). We have first-hand evidence that Morgan was free-swimming up until the moment that she was captured by the staff of the Dolfinarium Harderwijk. The Dolfinarium Harderwijk, after holding Morgan for an extended period, then claimed that she needed to be moved in order for her to be able to socialise with other orca. However, under EU law Morgan could only be moved if the facility she was to be transported to was a registered ‘Scientific Institute’ AND she was only to be used for ‘Scientific Research’ AND only if there were no other captive born individuals of her species already present in the EU. The Dolfinarium Harderwijk then, despite not being able to fulfil any of these legally mandated requirements, made an application to CITES in the Netherlands, to move Morgan to Loro Parque on the Island of Tenerife, Spain. 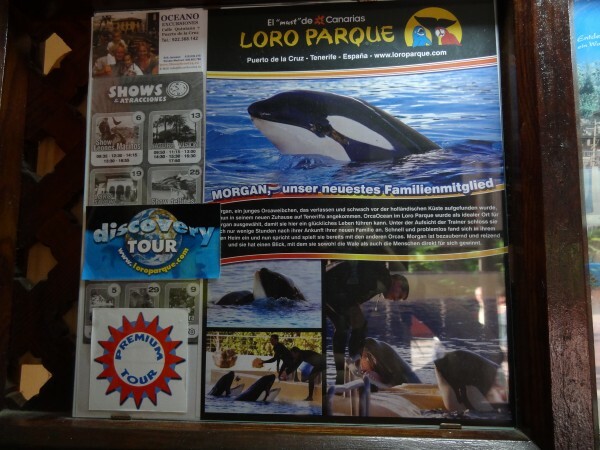 Within that application they made a number of false claims, including Morgan’s age (stating that she was only 18 months old at the time of capture, which was clearly not the case, based on her length they had reported at capture), that Loro Parque was conducting ‘extensive scientific research’ using the orca that they held at the facility and, that this research benefited wild orca. They never applied for a permit to use Morgan for commercial purposes (such as public display or in circus-like shows) and they never applied for her to be used for breeding, as both of these uses were not legally valid reasons for applying for her to be moved. The Dutch CITES Management Authorities, despite being provided evidence in the Court hearings for Morgan, did not complete due diligence and follow up on challenges made by the Orca Coalition and the Free Morgan Foundation regarding the legitimacy of the CITES transport permit (also known as an EG-permit). Rather, they went ahead and for only €15 (see ‘Price’ ‘Total’ boxes on page 4 of the application), issued a transport permit for Morgan (who’s value was somewhere between US$10-$20 million) to be moved to Loro Parque. At some point along this trail, Morgan was claimed as an asset by SeaWorld Entertainment, Inc., who is based in the USA (this is effectively “whale laundering“). When the Dutch issued Morgan’s EG-permit, they issued it with a Governing Letter, which strictly outlined that Morgan was to be used only for ‘Scientific Research’ (that is, no permission was given for her to be used for commercial purposes, nor for breeding). Despite this, Loro Parque (apparently on behalf of SeaWorld Entertainment, Inc.,) have been attempting to breed Morgan. Additionally, they use her frequently in the commercial pay-to-view circus-like shows that they conduct three times a day, every day of the year. Morgan has been used as a ‘draw-card’ for the theme-park in their commercial advertising, appearing on poster and billboards around the Island.